ACJP Organizer Gail Noble writes a commentary on what State Attorney Marylin Mosby’s decision to charge the officers involved in the murder of Freddie Gray means to her as a mother of three black sons. When I heard the six police officers in Baltimore were being charged, I was shocked and overjoyed. “Yes!” I said with fists in the air. I thought about Freddie, the severe pain I heard in his voice when he cried out. I remembered the images of his limp body as they dragged him to the van. If officers are that blind to a person’s welfare, they deserve to be charged and I pray they are convicted. 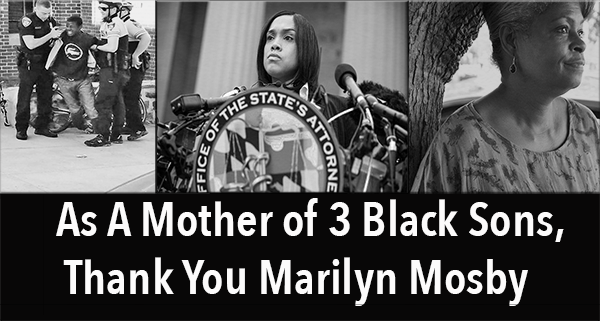 As a mother of three black sons, hearing State Attorney Marilyn Mosby’s words were especially vital for me. Everyday, I fear for my three sons living in an America which is plagued with racism and police brutality. I have had my sons call me saying, “Mom, I just got pulled over by the police for no reason,” more times than I care to remember. Or, “Mom, I was walking and the police rolled up on me and asked where was I going, and let me see your ID.” Each call, I would feel frustrated, mad, and powerless. My only recourse, for safety reasons, is to teach them how to act when this happens. I would tell them, “You don’t give them a reason to arrest you even when they talk about you and disrespect you, because they are looking for any little thing to provoke you.” It frustrates me that this is the lesson I would have to teach them for their own protection. When my sons go out at night, my greatest fear is to hear the phone ring. When they call, the first words out of my mouth are, “What’s wrong?” I live in constant fear they will be stopped by the police, and that something will go wrong. The police will say they moved too quickly, or reached for something, or they looked like some dangerous suspect — and then some tragedy. One time one officer said he was suspicious of my oldest son because his car was big enough to carry weapons. This is the type of rationale you have to deal with when you are the mother of three black sons. That’s why when I listened to Marilyn Mosby, I heard her as a mother. State Atttorneys, or District Attorneys, are supposed to be about justice, but a lot of them have lost their way. Marilyn prepared for this case, she hired independent investigators, along with her department’s investigators. She was looking for the truth, found it, and acted upon it. Marilyn Mosby did her job, the way I wish all District Attorneys would. She didn’t cover up the carelessness and the inhumane way Freddie was treated by the polices officers. I felt her confidence, her conviction, her fearlessness, and strength for justice. District Attorneys who have lost their way, study Marilyn Mosby and start to practice true justice in your communities.